Add SolarWinds® Serv-U® Gateway to your Serv-U MFT or Serv-U FTP Server to safely allow incoming connections in the DMZ and provide deeper protection for file transfers. No data is stored in the DMZ. The product is designed so that incoming connections to the internal network are safely accepted without exposing sensitive systems. Gateway is designed to provide defense-in-depth protection to Serv-U deployments. This type of architecture is essential to help you meet PCI DSS, managed file transfer, and other high-security requirements. Helps distribute incoming connections to different Serv-U MFT Server instances with the help of network load balancers. Installation and configuration typically in under one hour with 100% GUI configuration, and helps to simplify configurations for complex Serv-U deployments. Deploy Gateway with Serv-U MFT Server to better protect data, and centralize and simplify file transfers in your organization. Gateway plays a similar role to that of a reverse proxy server. It’s designed to safely handle traffic that should not be directly passed from the internet to secure internal systems. Serv-U Gateway two-tier deployment satisfies most “managed file transfer” requirements. Supports deployment on virtualized nodes and without processor or core limits. The Serv-U native 64-bit application maximizes performance and runs on Windows Server 2008R2, Red Hat Enterprise Linux, and other Windows and Linux operating systems. ODBC-compliant databases such as SQL Server, Oracle, and MySQL are optional. See technical documentation. We give you a 14-day trial for immediate download. It typically takes less than one hour to install, connect, and configure. The trial includes all the features of your Serv-U MFT or FTP server and the full complement of the Serv-U mobile and web interfaces on both IPv6 and IPv4 networks, all managed from your existing Serv-U management console. Multiple gateways can be deployed in different DMZs or other protected zones. External partners can connect to Gateway, while internal employees continue to connect directly to Serv-U. You pick which services and addresses are live on each Gateway. Safely accept all incoming connections on a hardened server (whether using FTP, FTPS, SFTP, HTTP, or HTTPS) located in the DMZ segment. Avoid inbound connections from the DMZ to the secure private network. Helps ensure that no data is stored in the DMZ segment. Supports FIPS 140-2 validated cryptography. Présentation des fonctionnalités Add SolarWinds® Serv-U® Gateway to your Serv-U MFT or Serv-U FTP Server to safely allow incoming connections in the DMZ and provide deeper protection for file transfers. What is Gateway and why do I need it? Where can I find helpful information on installation and customization for my Serv-U Gateway product? 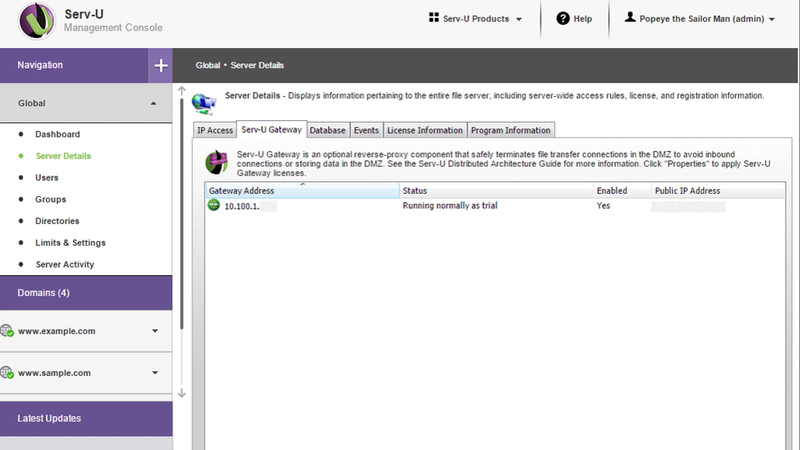 Serv-U Gateway provides defense in depth to your existing or new Serv-U deployments. It acts as a reverse proxy in demilitarized zone (DMZ) segments and prevents your Serv-U deployments from storing data in the DMZ or opening connections from the DMZ to the internal network. This type of architecture is essential to help you meet Payment Card Industry Data Security Standard (PCI DSS), managed file transfer, and other high-security requirements. There is a Serv-U Gateway section in the SolarWinds customer success center that was created using customer feedback and contains screenshots, guides, and articles to help you be more successful with your installation and customization. How does Serv-U Gateway work? Serv-U MFT Server or Serv-U FTP Server connects to Serv-U Gateway and tells it to listen to client connections on specific IP addresses and ports. This connection is called the “Gateway Connection Channel.” Gateway stitches the incoming client connection to the new Gateway Data Channel created specifically for this connection, and helps to facilitate safe data transfers between the FTP client and Serv-U file transfer server.